Forecast of 45mph headwinds – why am I doing this? With departure set for the day after tomorrow, just 36 hours away, I was amused trawling old photos to find this first recorded evidence of my passion for spoked wheels. I guess I’m under a year on the left, and about three on the trike on right. The photos will have been taken in the summers of 1951 and 1953 respectively in the garden of the tiny farmhouse at Duckshole (wonderful name) just outside Holt in North Norfolk from which we moved in 1953. 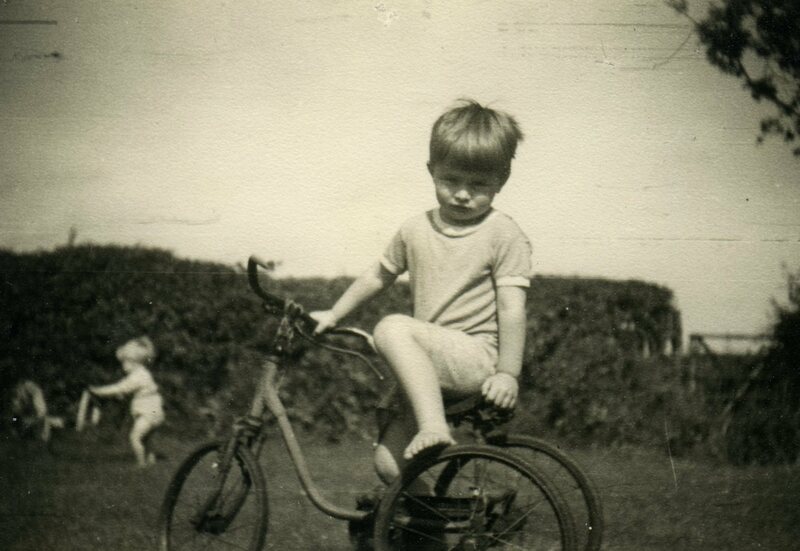 Not sure why I look so glum, as little brother Hugh, 18 months younger, tests his own smaller-wheeled hobby horse in the background. But nearly 60 years ago, neither of us will have been bothered (elegant segue coming here into the purpose of today’s post) by the winds the Met Office is predicting for the rest of this week down here in the other agricultural end of England in the Cotswolds. Today, Monday, was gorgeous – ridiculously and global warmingly so like the past fortnight – but just in time for my planned departure 40 miles up the Fosse Way North-East to old friend Judy in Banbury, we’re warned to expect viciously cold headwinds on Wednesday from that precise direction, gusting to a truly horrible 45mph. I’m not trying to break any records with this bike trip, and need to nurse sore necks and knees anyway, so perhaps I should delay departure until the winds abate? Judy says that for someone planning to cycle in Siberia (well, actually I’m planning to use the railway there), it would be wimping out. I guess she’s right, and with better half Sue planning a special evening departure party tomorrow with some dear old friends, I suppose I’d better just wrap up warm and dry, and head-down, just pedal off. I won’t put the decision the vote, but many thanks to those of you who responded to my plea in the last post for guidance on whether to set my equipment to miles or kilometres. By eight votes to three at the time of writing, the miles have it. Miles it will be. Kilometres are modern, but I agree, as a child of the 50s one just doesn’t have the same warm, cosy relationship with Kms as one does with miles. Briefly, then, with headwinds and Very Many Miles looming, some thoughts on why I’m doing this crazy trip. I could – and probably will over the coming months – write reams in answer. But there are some simple immediate explanations. First, long-distance solo cycling is the nearest I’ve approached to pure, continued, constantly-renewed happiness. Bowling along at the speed of birds, intimately breathing, smelling and experiencing the passing countryside and nature, with space to think and dream and reminisce and plan, to stop and go where I like, certain of a warm sleeping bag if not bed every evening but rarely knowing where that will be: even a spiritual retreat, of which I’ve tried a few, doesn’t come close. Using our bodies out in nature is what we’re designed to do, and the endorphins and serotonin that flow from vigorous continued exercise deliver a sense of wellbeing – most of the time, at least – which in my experience has no compare. Also, since camping across Ireland with a Leeds university friend (John Searle, where are you?!) for three weeks in 1976, I’ve always wanted to do a really long-distance solo bike ride. At 62 in a fortnight, therefore, and with the very nasty experience of crushing my neck nerves with that binge evening in Dublin in 2010 (DON’T DO IT, JUST DON’T DO IT! ), I know that if I don’t do this trip now, I never will. What’s more, as many of you know who’ve wearily listened to me droning on in recent years, I am sadly convinced that we only have a few more years as a species during which this kind of self-indulgent journey will be possible, as extreme weather, global warming, drought and floods and economic meltdown upend all our comfortable baby-boomer assumptions about fossil-fuelled growth and prosperity. With temperature and rainfall records crashing around the world, at both extremes, I want to take a really close look at this planet and at my old journalistic haunts while I still can. I will indeed write much more about such things as the journey progresses – so to conclude for today, a Google map about the more immediate future which I hope works to show just how I’m getting to the North Sea ferry in Harwich – four days of what I hope, despite headwinds, will be a relatively easy 40-50 miles a day. I’ve also got a new international mobile number – +44 7937028693 if you haven’t already noted it – on which I can take calls for free at my end (not yours, I’m afraid) and which I’m told I can use automatically to register my progress as I go. If it works, I’ll let you know. In the meantime, this will be my last post before departure, so thanks for all the wonderful good wishes for the journey – and if you haven’t yet sponsored me in aid of two-and-a-half good charities (about which I will also write as I go), feel free to give that some thought. Onwards! On two, not three, wheels. Will keep following your progress. Good luck, have a wonderful journey and lots of love from the office girls at CCPE. Missing you all already, Tanya and Karen and all. But singing with Oliver Twist, I’ll be back soon. All too, in fact.. Love from deepest Bedfordshire. A start, anyway. All the best in that wind, Mark – not to mention many further trials! Have sorted out the sponsorship direct with RPTrust. Bolshoye Spasibo, Ilya… Nice to know you’re following the blog.. We talked about you at Judy’s home last night, and those amazing trips we made from Moscow – both as a student group to Central Asia and the Caucasus, and of course me on my own down to you and your parents in Grozny. Byli vremena!!! Voted in your poll, but really I think you should write when something exciting/interesting happens. Though, if that’s every 5 minutes…maybe not! I could hardly believe my eyes when I saw your photos outside the door of Duckshole Farm, Holt – I lived there right after you!!! 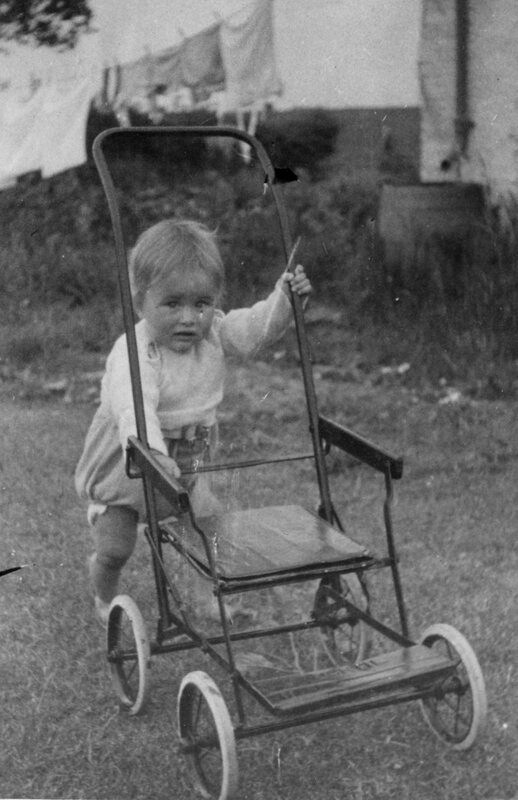 I have a photo of me on my tricycle, in almost the same spot!!!! !